Our high quality 2-1/2" x 3-5/8" school size laminating pouches with short side slot help to improve the value of all printed materials. They enhance colors by turning dull prints into bright lustrous colors, help to prolong the life of printed materials and preserves them and protect them from outside elements. 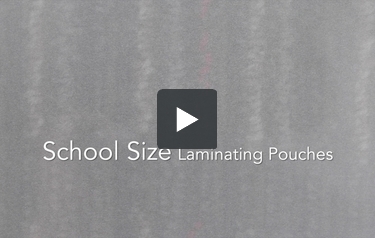 Transcript: These are School Size Laminating Pouches! Compared to some common sizes, this school size is about half an inch larger—on both sides—than a business card. It’s available in 5, 7, and ten mil thicknesses. And generally you won’t find anything thinner than that with this small of a pouch. You can also get these pouches with prepunched side slots on either the length or width side. These are School Size Laminating Pouches! Compared to some common sizes, this school size is about half an inch larger—on both sides—than a business card. It’s available in 5, 7, and ten mil thicknesses. And generally you won’t find anything thinner than that with this small of a pouch. You can also get these pouches with prepunched side slots on either the length or width side. Using a lamination pouch is simple: First open your pouch and insert your project, align all the edges so they are even. Then place the pouch into the carrier, so that they open the same way. The edge where the two sides meet is called the crease. Line up the carrier and pouch crease. With pouch in place, slide the carrier into your pouch laminator crease end first as seen here. When it’s done, remove the carrier and unveil your beautiful new laminated project!